Program TRC_MAUZ translates track irregularities expressed in Cartesian coordinates into a Mauzin-registration. The input data file is read in free format, but the columns in the file shall have the same contents as in a trac-file. The output data file is written in mauz-format. The user also has the possibility to add designed curves to the track irregularities. Scale factor for vertical level, right rail, when writing the Mauzin filtered registration to file UTFIL. Scale factor for vertical level, left rail, when writing the Mauzin filtered registration to file UTFIL. Scale factor for lateral versine, right rail, when writing the Mauzin filtered registration to file UTFIL. Scale factor for lateral versine, left rail, when writing the Mauzin filtered registration to file UTFIL. Scale factor for column 3, cant unevenness, when writing the Mauzin filtered registration to file UTFIL. Scale factor for column 4, twist, when writing the Mauzin filtered registration to file UTFIL. 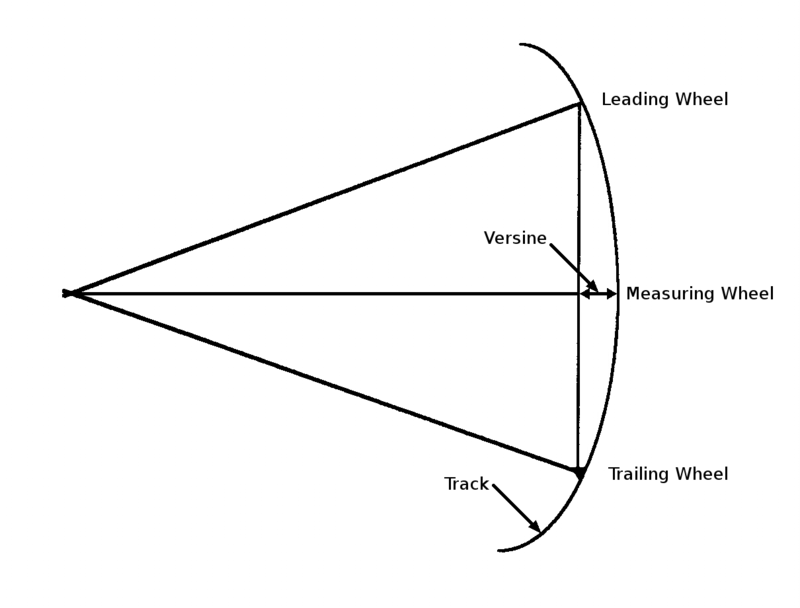 Nota Bene: The scale factor 1:11/8 due to the fact that the axle distance is 2.75[m], but the result is presented as the track twist over 2[m], is included in the method and shall not be included here. Scale factor for column 7, gauge, when writing the Mauzin filtered registration to file UTFIL. SFZH = 1., SFZV = 1., SFFI = 1., SFC = 1., SFYH = 1., SFYV = 1., SFSPV= 1.